Category: Get out of the way! Parenting ‘young adults’: Know when to let go! How much parental control is right and necessary in helping “young adult” children make Life choices, especially with regard to their companions? What does a parent do when the young adult child is, at least in the eyes of the parent, committing a mistake, virtually hara-kiri? What must be done when parents and young adult children can’t understand each other anymore? But first, let’s quickly review the Cheran-Damini context. Damini says she wants to marry and live with her boyfriend Chandru, who was an apprentice in Cheran’s office. She has complained to the Chennai Police Commissioner that her father used goons to harass Chandru and even had him roughed up on a few occasions. 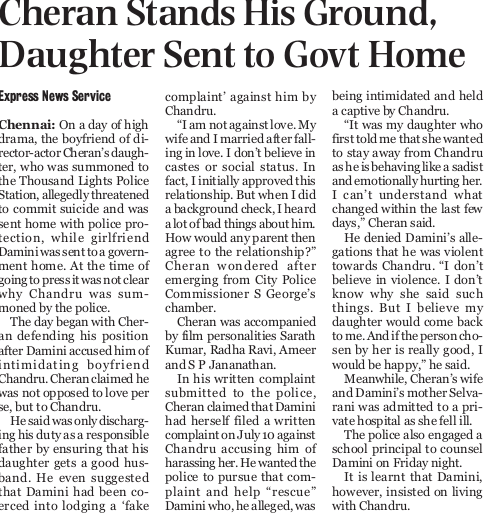 Cheran, on the other hand, has clarified that he is not against his daughter choosing her Life companion but is against her relationship with Chandru, whose character, says Cheran, is “not very good”. Prima facie, both father and daughter appear to be right in looking at things the way they are, from where each of them is seeing it! Damini believes in Chandru implicitly. And Cheran refuses to. Possibly Cheran has his own valid reasons – because he’s looking at Chandru as a parent and not as a lover. So, he’s seeing something that Damini, at this time, given her age and her limited exposure, is not seeing. Now, the best way forward for both parties is to let go. First for Cheran to let go and accept that his daughter is now a young adult, who cannot and must not be controlled. And, next, for Damini to appreciate that her father is no villain and only wants her not to be hurt in the future, if her choice of being with Chandru, does not work out for whatever reason. Advise – First attempt advise. Share your Life experience with regard to the context on hand. Place both pros and cons. Transparently. Calmly. Enable informed and intelligent choice-making by your child. Champion – When you notice that your child persists with a choice that you don’t agree with, invite the child for another round of conversations. Don’t reprimand. Remember: each individual is adventurous in her or his own way. Your child perhaps loves experimenting. Don’t restrain that spirit. Instead, champion your school of thought, calmly, with compassion. Outline where the child’s choice will end up, according to you, should the child insist on walking down that path. Always remind the child that if she or he fails, she or he is “welcome” back home anytime. Let Go! – When you still don’t see your child picking up your sage counsel, simply let go! Keep an open mind. Wish your child well. Be open to you being wrong with your assumptions. Because ultimately, it is your child’s happiness that you want. And not wanting to prove your correctness or yourself right! Never say ‘I told you so!’ – Should the child’s gambit fail, and she or he has to come back to you, simply receive her or him unconditionally. Don’t rub it in. Don’t say “I told you so!”. This is not an ego battle that you have won. Your child is back with you only because she or he realizes the mistake. Celebrate that learning, so that the mistake is not repeated, with care and compassion. This process works fine in any context. Whether your child has a problem with academics or alcohol or tobacco or relationships or values. This process, above all, ensures peace and harmony while dealing with different approaches to Life and wherever conflicting views, between parent and child, emerge on Life choices being made. I have learned from Life that there is no right way or wrong way to live Life. Each of us has our own journeys, peppered with our own unique experiences that lead us to our own personal learnings. The most important aspect of parenting is to know when to advise and when to let go. To be sure, by letting go, you are not being irresponsible. In fact, you are being mature – because you are preserving decorum and harmony in the relationship with your “young adult” child. The world is already ridden with enough strife and misunderstandings. Surely, you don’t want your small world too to be torn asunder by the same factors. Each of us learns to live Life more from experience than from being told how to live it! So, this Friendship Day, choose to be your “young adult” child’s best friend! Simply enable her or his learning too by letting go and, if required, getting out of the way! Author AVIS ViswanathanPosted on August 4, 2013 March 14, 2016 Categories Art of Living, Cheran, Children, Damini, Get out of the way!, http://schemas.google.com/blogger/2008/kind#post, Inner Peace, Intelligent Living, Let Go, Parenting, The New Indian ExpressLeave a comment on Parenting ‘young adults’: Know when to let go!